Puerto Rico took it very hard, sadly 9 people have been reported dead so far. The entire island is without power and reportedly for quite some time. These storms are NO JOKE. Our thoughts and prayers go out to PR, and now the DR where Maria is right now. Our friends on the ground in Turks are finishing putting roofing back onto buildings and apartments for cover when Maria hits. They are waiting on line for plywood and sandbags. Dinesh our property manager waited on line for sheets and was able to get some WHILE SHE HAS THE FLU! Feel better! On Chalk Sound there is a project underway today to really clear out the debris. It's starting now, anyone with a truck is going down that way since most of the trucks on island are busy. We don't want the debris to swirl up in the winds and do more damage or hurt anyone. 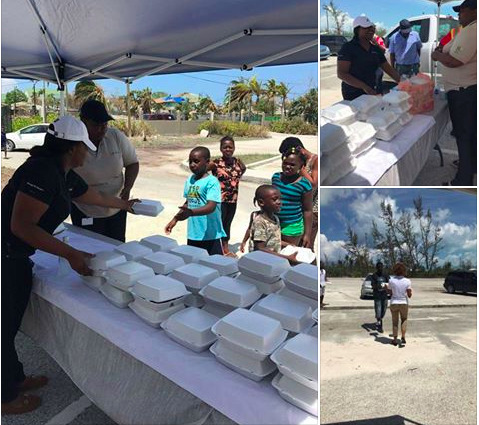 There has been a lot of community help and gathering, for instance our energy company Fortis was out with hot meals in the 5 Cays area. The community is really coming together! Grand Turk and Salt Cay after 2 P.M.
South and East Caicos after 4 P.M.
Middle Caicos after 5 P.M.
North Caicos after 6 P.M.
Providenciales and West Caicos after 8 P.M.
We are almost at our goal of $10,000 with our Go Fund Me Campaign for Turks and Caicos. We will personally match $10,000 once this goal is hit. Hopefully today! Please share this, the TCI needs any little bit!